"The Sopranos," which towered over television with its visceral, violent depiction of a modern mob boss' world and an unparalleled finale, could dominate its last Emmy Awards. Or could it be foiled by the fresh-faced kids of "Heroes"? The nominations announced Thursday for the 59th annual awards ceremony in September give the edge to HBO's landmark drama, whose 15 nominations were the most for any series. But the sci-fi sensation "Heroes" earned an impressive eight bids for its first season, including best drama. Cutting-edge shows dominated the comedy series category, with "Ugly Betty" leading the charge with 11 nominations. America Ferrera, who stars in the show based on a Colombian telenovela, heard the nominations with cast mates at the home of one of the writers. "We popped a bottle of champagne and lots of screaming and hugging. It was fun," said Ferrera, who passed on the champagne because she had to be on the set later in the morning. She's the first Hispanic woman to be nominated as best actress in a comedy since Rita Moreno received a bid in 1983 for "9 to 5," the TV academy said. "We've been really lucky to come out at a time when there was an audience ready to receive it," Ferrera said of the series' success. "We've got a lot of attention, I think, just based on the fact the show is pretty different than anything that is out there right now. I think just the title alone from the get-go captivated people to get interested and see what it's about." Other contenders for the best comedy trophy include freshman "30 Rock," "Entourage" and last year's winner, "The Office." The only traditional three-camera sitcom to make the cut was "Two and a Half Men." "Entourage," about the adventures of a young movie star and his loyal rat pack, was embraced despite its mockery of industry stereotypes. "It may seem sometimes like we're making fun of Hollywood," said creator Doug Ellin, "but really we're just trying to take a comedic look at how things are done here, because this is how it really is for people sometimes." Medical drama "Grey's Anatomy," after a rocky year that saw the firing of Isaiah Washington over his use of an anti-gay slur, scored 10 nominations, including a best-drama bid and supporting nominations for four cast members. Among them was co-star T.R. Knight, who had clashed with Washington. Other best-drama series nominees were "Boston Legal" and "House." "The Sopranos," which premiered in January 1999 and aired in fits and starts, capped its final episode this year with an ambiguous ending that left fans in the dark about the fate of lead character Tony Soprano, last seen sitting in a diner with his wife and children. A suddenly black screen suggested he might have been whacked - or not. James Gandolfini, who played the beefy but emotionally fragile mob boss, and Edie Falco, who co-starred as his usually stalwart wife, Carmela, both received top acting nominations. The series' other nominees included Michael Imperioli, who received a bid for best supporting dramatic actor for his role as the ill-fated Christopher. Aida Turturro, who played Tony's tough sister Janice, and Lorraine Bracco, who co-starred as his uneasy psychiatrist Dr. Melfi, were nominated for supporting actress. Joining Gandolfini among lead drama series actor nominees were Hugh Laurie of "House," Denis Leary of "Rescue Me," James Spader of "Boston Legal" and last year's winner Kiefer Sutherland of "24" - which was last year's drama series winner but was snubbed this time. Falco will compete with Patricia Arquette of "Medium," Minnie Driver of "The Riches," Sally Field of "Brothers & Sisters," Kyra Sedgwick of "The Closer" and last year's winner, Mariska Hargitay of "Law & Order: Special Victims Unit." Sedgwick got the news immediately. She and Jon Cryer, a nominee himself for "Two And a Half Men," helped announce the bids in a brief ceremony at the Academy of Television Arts & Sciences' Leonard H. Goldenson Theatre. "She's all ruffled. She didn't know that was coming!" Cryer said of Sedgwick, who flubbed her lines after announcing her own nomination. Along with Ferrera in the lead comedy actress category were Felicity Huffman of "Desperate Housewives," Tina Fey of "30 Rock," Mary-Louise Parker of "Weeds" and last year's winner, Julia Louis-Dreyfus of "The New Adventures of Old Christine." Their actor counterparts included last year's winner, Tony Shalhoub of "Monk," Ricky Gervais of "Extras," Steve Carell of "The Office," Charlie Sheen of "Two and a Half Men" and Alec Baldwin of "30 Rock." Like "Grey's" Washington, Baldwin drew unflattering attention this year, in his case because of a leaked recording of an angry telephone call to his daughter, who is caught in Baldwin's legal dispute with ex-wife Kim Basinger. The made-for-TV movie "Bury My Heart at Wounded Knee" led all nominees with 17 bids, while the miniseries "The Starter Wife" also was a top nominee with 10 bids. "Bury My Heart at Wounded Knee," adapted from Dee Brown's nonfiction best-seller, received nominations for best made-for-TV movie, writing and for supporting acting. The film chronicles the Sioux victory over Custer at Little Big Horn and events leading up to the assassination of Sitting Bull and the Sioux massacre at Wounded Knee Creek in 1890. In the reality-competition categories, the leading nominee with eight bids was "Dancing With the Stars," followed by "American Idol" with seven. Altogether, 463 nominations were announced. HBO was the most recognized with 86 bids, followed by ABC with 70, NBC with 69, CBS with 44, Fox with 28, and PBS with 24. 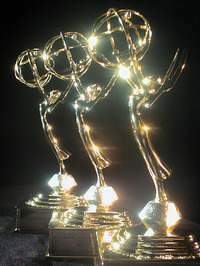 The three-hour Emmy Awards ceremony will be broadcast Sept. 16 by Fox from the Shrine Auditorium.